Location: Home » Archive by category "Workshop"
Posted March 8th, 2013 by piet & filed under News, Workshop. 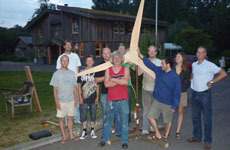 Participants will learn how to make an efficient and durable wind turbine from scratch in this intensive, four-day, hands-on workshop. Posted August 18th, 2012 by piet & filed under News, Workshop. Stichting Energy Solutions for Humanity (ILWP Mali) gives exclusive workshop for Stichting Emmaus in Haarzuilens, one of their main sponsors of the Mali project.